I had seen Hannie Goldgewicht’s work many times on our website and on social media, but when I saw it in person, it was as if I had discovered a buried treasure. Hannie’s vessels, bowls, boxes, and wall sculptures are all full of detailed surprises, exceeding any expectation you may have from seeing them in a photograph. The textures are rich—from the ceramic structure to the weavings of the pine needles. 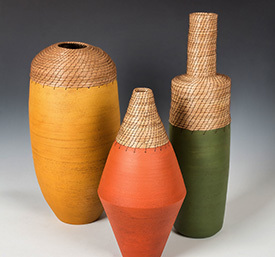 Hannie Goldgewicht’s vessels and boxes. Hannie is a native Costa Rican living in Los Angeles. She studied sculpture and explored many creative media, from ceramics to metal, wood to stone, and textiles to handmade paper. She traveled around the world observing and being influenced by different cultures and different artistic styles. On a trip to Argentina with her husband, he introduced her to his aunt Delfa Deriu, a master in fiber. After seeing Deriu’s work, Hannie was drawn to the pine needle basketry. It was the first time she had been made aware of this type of work, which is not a typical Argentinian craft. 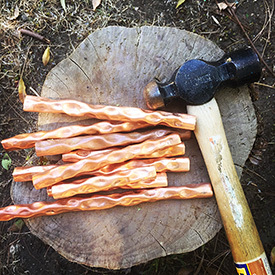 After spending an afternoon with Delfa learning how to weave, Hannie returned to Costa Rica, inspired to master and incorporate this newly acquired technique into her ceramic pieces. Hearing Hannie express the enthusiasm and passion she has for her work makes you appreciate her art in a renewed and even brighter light. As we settled deeper into our conversation, I asked Hannie how long it takes to create one piece of work. It became clear that it’s difficult to pinpoint a standardized timeframe due to her comprehensive, detail-oriented process. 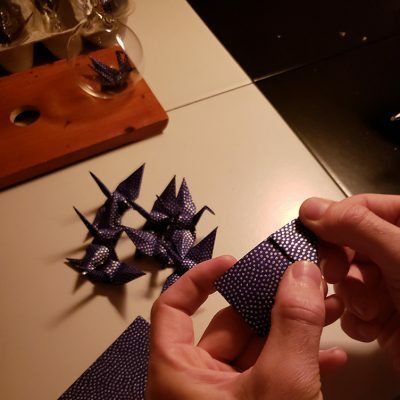 Each piece has a multi-step process. 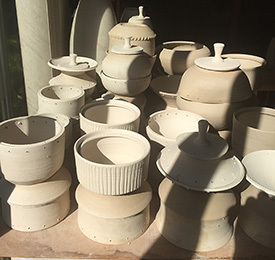 Every piece starts on the potter’s wheel, where she can easily spend all day creating various vessels, bowls, boxes, and platters. 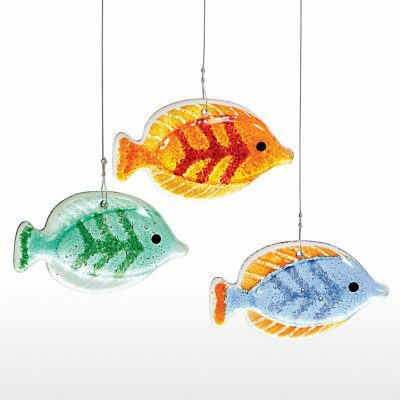 Hannie throws enough to keep a stock of different sizes and designs at hand. The pieces are then trimmed, pierced with holes for weaving, fired, and finished with paint and patinas. Stock of vessels already fired. Hannie sanding the fired pieces. After the ceramic piece is done, she begins the longest part of the whole process: basket weaving with pine needles. Depending on the size of the vessel, it can take as short as an hour or up to a couple days to complete the woven portion. Hannie usually saves the basket weaving for the end of the day, when she can weave and unwind as she sits on her couch and catches up on her favorite TV shows. 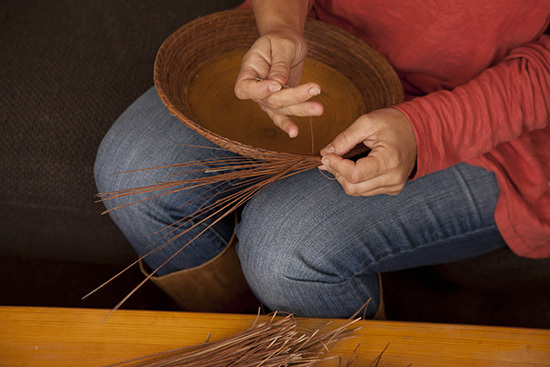 Hannie Goldgewicht pine needle weaving a ceramic plate. 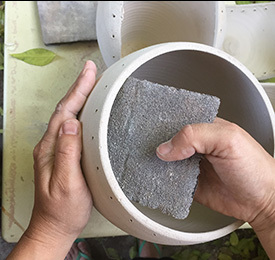 To be able to weave her ceramic pieces, Hannie requires bunches of pine needles to work from. Hannie uses the ancient way of acquiring pine needle supplies: by traveling to different locations and hand picking the perfect pine needles herself. She always keeps an eye on the pine trees wherever she goes, ready to gather pine needles at any time. One of her favorite locations to gather pine needles is in San Diego. 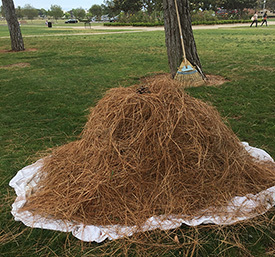 On a trip to San Diego for an art fair, she spotted soft pine needles near the shoreline. Her family has become great contributors in the pine needle process. Hannie’s husband and son help her with gathering pine needles, and when her mother visits she helps Hannie bundle, separate, and clean them. Hannie Goldgewicht’s mom with a month’s load of bundling. Once she has her bunches of pine needles, she cleans them by soaking them in water so she can separate and straighten them out. Then she dries the needles and takes the tops off. “Some basket weavers leave the tops, but I like them bare,” says Hannie. Hannie Goldgewicht taking the tops off the pine needles. Gathering and cleaning the pine needles is a lot of work and very time-consuming, but it is part of the process to creating the beauty in her masterpieces. 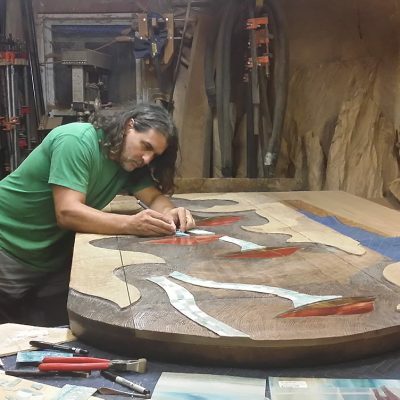 Wall sculptures undergo the same type of process. Since she keeps a stock of ceramic parts, she works in sections. 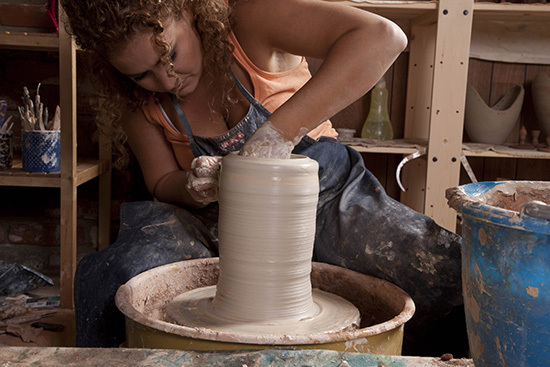 She spends different parts of the day throwing on the potter’s wheel, designing new work, and weaving. Hamming copper to add texture. 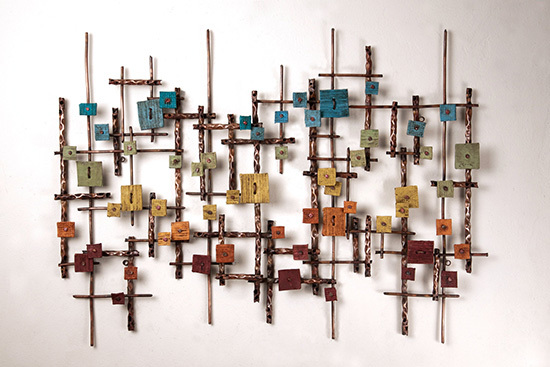 Her wall pieces are abstracts inspired by the nature that surrounds her at home, on her trips, or on a daily stroll. Hannie went on to explain what inspired one of her most complex pieces, her Rainbow wall sculpture. It was on a day that it rained while she was on her walk through the observatory and she caught a glimpse of a rainbow reflecting over the city. What makes Hannie’s work even more intriguing is the one-of-a-kind story behind each piece. Hannie talks about how she loves hearing the stories of what others think the pieces stand for or what they take away from her work. 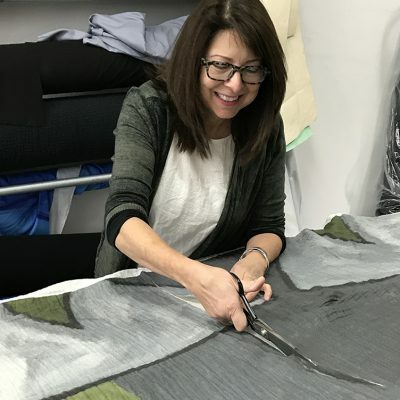 Learning about each step it takes to create a particular vessel or wall sculpture and how dedicated Hannie is to her work truly increased my appreciation for each masterpiece Hannie creates.